The thrice-monthly Journal was put on hold due to personal time constraints. For information on current rarities being observed in Virginia Beach, please check the Noteworthy Observations Page, which is still being maintained. While it is the shortest of the thrice-monthly periods, Late February managed to hold its own in terms of both quantity and quality! Matching mid-February, 144 species were logged to eBird this period, and Virginia Beach birders closed out the month with a strong list of 168 species (up significantly from the 155 logged in February 2018). Temperatures dropped a bit this period from the late winter heat wave experienced in the middle of the month, though flowering trees continue to blossom. The real weather headline was the amount of rain we received though, and it felt as though the sun was only out for maybe one or two days in total this period. Highlights this period included new rarity records for CACKLING GOOSE, BARN OWL & LARK SPARROW, continuing rarity records for TUFTED DUCK, HARLEQUIN DUCK, COMMON MERGANSER, PURPLE FINCH & BREWER’S BLACKBIRD and continuing unseasonal records for BLUE-WINGED TEAL & BLACK-AND-WHITE WARBLER! A pair of CACKLING GEESE were discovered foraging in a flood field north of Gum Bridge Road (just west of Charity Neck Road) with a large flock of Canada Geese on 23 Feb (vis. Matt Anthony & Nick Newberry). The pair was observed again the following day along with Canada & Snow Geese, as well as a single Tundra Swan (ph. Rob Bielawski). Later in the day, the several-day-long...Click Here to Continue Reading! The fields are purple with clover and white with Snow Geese, the early blossoming trees (Bradford Pears, Tulip Trees & Redbuds) are already showing flowers, daffodils are starting to pop, and we logged a remarkable new species for Virginia Beach this period! Mid-February produced a total of 144 species reported to eBird in the city, including four new species for the Virginia Beach calendar year list, which now sits at 177 species! An astonishing number of eBird checklists were submitted this period, bolstered heavily by the Great Backyard Bird Count event sponsored by the National Audubon Society, as well as by field trips in the city hosted by the Hampton Roads Bird Club & Richmond Audubon Society. Highlights this period included new rarity records for TUFTED DUCK (the very first record for Virginia Beach! ), AMERICAN WHITE PELICAN & RUSTY BLACKBIRD, continuing rarity records for HARLEQUIN DUCK, COMMON MERGANSER, DOVEKIE & PAINTED BUNTING, new unseasonal records for SANDWICH TERN & BLACK-AND-WHITE WARBLER, continuing unseasonal records for BLUE-WINGED TEAL, an early first of season record for LAUGHING GULL and a first-of-year record for AMERICAN WOODCOCK! First off, the headliner: TUFTED DUCK! Found during the late morning hours on the lake behind Chartway Federal Credit Union’s headquarters on Cleveland...Click Here to Continue Reading! Record-setting heat arrived in early February across southeast Virginia, which made this a rather interesting first period for the late winter season. Early on, frigid temperatures in the Midwest and Northeast states continued to push waterfowl into much of Virginia, and while we did benefit a bit here on the coast, it seemed to be the drastic rise and drop of temperatures later in the period that really boosted our sightings locally. All told, the Early February period produced a total of 153 species reported to eBird in the city, including two additions to the Virginia Beach calendar year list which now sits at 173 species! Most reports this period originated along the immediate coast, with the Williamsburg Bird Club’s boat trip to the islands of the Chesapeake Bay Bridge-Tunnel greatly aiding in the number of lists submitted. Highlights this period across the city included new rarity records for COMMON MERGANSER, AMERICAN WHITE PELICAN, PAINTED BUNTING, PURPLE FINCH & LINCOLN’S SPARROW continuing rarity records for HARLEQUIN DUCK, WESTERN GREBE, PARASITIC JAEGER, BLACK-HEADED GULL & SNOW BUNTING, new unseasonal records for BLUE-WINGED TEAL, continuing unseasonal records for BLACK-AND-WHITE WARBLER, late records for lingering BLACK SKIMMERS, first-of-year records for BLACK-BELLIED PLOVER and interesting records...Click Here to Continue Reading! Late January proved itself to be yet another period jam-packed with birding excitement! Heavily bolstered by the Virginia Beach Parks & Recreation department’s Winter Wildlife Festival, hundreds of eBird checklists poured in over the last eleven days, producing records for 153 species, including 8 new additions to the city’s 2019 list, which now sits at a remarkable 171 species! Among the vast array of species observed, highlights this period included new rarity records for EURASIAN WIGEON, COMMON MERGANSER, DOVEKIE, PURPLE FINCH & CLAY-COLORED SPARROW, continuing rarity records for CACKLING GOOSE, HARLEQUIN DUCK, ICELAND GULL, PARASITIC JAEGER & WESTERN TANAGER, new unseasonal records for BLUE-WINGED TEAL, continuing unseasonal records for YELLOW-THROATED WARBLER & BLACK-AND-WHITE WARBLER, late records for lingering BLACK SKIMMERS, first-of-year records for WILSON’S SNIPE, GREAT CORMORANT, RUDDY TURNSTONE, TREE SWALLOW & NORTHERN BOBWHITE and out-of-place records for BRANT & LONG-TAILED DUCK! Starting off with the newly found rarities, a drake EURASIAN WIGEON was observed along Long Creek near the Great Neck Road bridge on 27 Jan (ph. Michelle Payne), marking a first record for this species in Virginia Beach this...Click Here to Continue Reading! The warmer than normal winter continued into mid-January, but we did finally begin to see a drop in temperatures at the period close. After early January afforded records for 150 species in Virginia Beach, which essentially covered most of the expected winter and permanent residents present this time of year, we did tally an additional 13 species to that list in the middle third of the month. Rarity records continued to flow into eBird this period and were highlighted by new finds for DOVEKIE, BLACK-HEADED GULL, AMERICAN WHITE PELICAN, WHITE-CROWNED SPARROW & PARASITIC JAEGER . Continuing rarities from prior periods included CACKLING GOOSE, HARLEQUIN DUCK, BREWER’S BLACKBIRD, WESTERN TANAGER & ICELAND GULL and unseasonal occurrences for BLUE-GRAY GNATCATCHER, BLACK-AND-WHITE WARBLER & YELLOW-THROATED WARBLER also occurred. We also saw some out-of-place records for BRANT and SNOWY EGRET as well! Kicking things off, we had our first record of the 2018-19 winter season for DOVEKIE when an individual was noted in flight with a group of five Razorbills off the Little Island Park pier on 16 Jan (vis. Andrew Baldelli)! This species is annually present off the coast of Virginia, but is difficult to observe from shore. 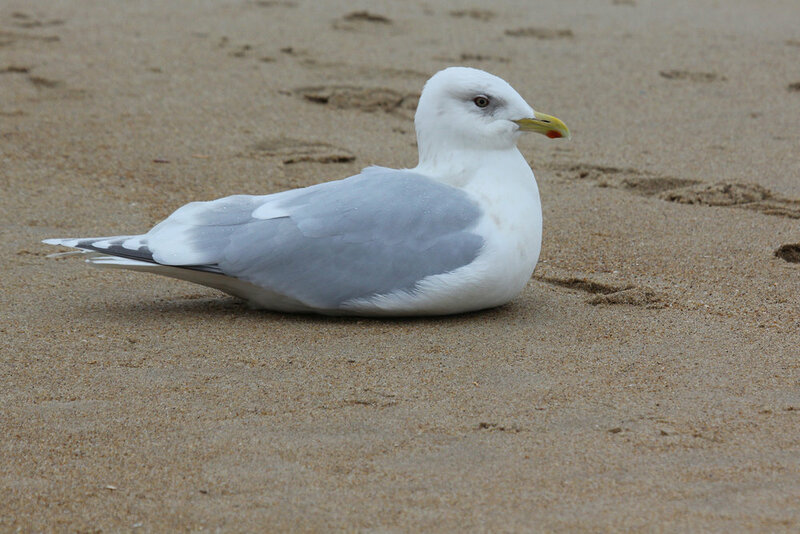 During the winter of 2016-17 however, Dovekie were observed during a mass movement of alcids...Click Here to Continue Reading! With the new year upon us, birders flocked to the coast to get off to a hot start on year lists, and Virginia Beach saw over 540 eBird checklists come in through the first ten days of 2019. Along the way, a great many rarities were documented throughout the city, some having lingered over from the late portion of 2018, and some being newly found. Leading the early January period was an incredible record for COMMON MURRE, as well as records for BREWER’S BLACKBIRDS beginning on the first of the year. Additional rarities that carried over at the same locations from late 2018 included: CACKLING GOOSE, ICELAND GULL, WESTERN GREBE, PARASITIC JAEGER, PURPLE FINCH, SNOW BUNTING, WESTERN TANAGER & PAINTED BUNTING. Unseasonal occurrences for BLUE-WINGED TEAL, RUBY-THROATED HUMMINGBIRD & BLACK-AND-WHITE WARBLER were also documented this period, and we also had a very late report for ROYAL TERN. The true highlight was the city’s first record for COMMON MURRE (ph. Alexis Rabon) dating all the way back to 1995. Observed a couple of miles offshore of Cape Henry from aboard the Whales & Wildlife Sea Adventure boat operated by the VA Aquarium and Marine Science Center, this is also our first photographically documented record in eBird. More information regarding these boat trips can be found...Click Here to Continue Reading!